UVic Weekend MBA challenges you to think differently, act responsibly, and have a global mindset. You are: an experienced professional with a career and a life (which you don’t intend to give up). You are looking for the academic depth and personal connections that will enable you to take the next step on your chosen career path. 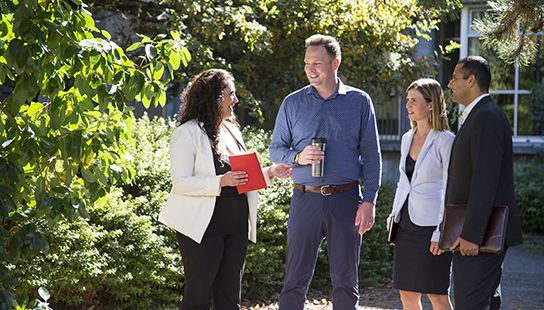 The UVic Weekend MBA is designed for you. The UVic Weekend MBA is the career accelerator for established professionals. Here, you’ll join like-minded professionals to hone and apply the critical skills you need to take advantage of today’s complex international business opportunities, in a weekend format that allows you to earn an MBA without putting life and career on hold. Come visit and see how the world looks different from here. You asked for a program that fits into a busy schedule while maximizing learning. The monthly in-class weekend schedule combined with flexible online learning in between provides you with a balanced approach to continue to work and learn. Classes will be held over a weekend, once per month for 24 months. Between class weekends, you’ll work with your team on course work and applied projects online or in person. The International Applied Project will take you overseas for a one-week immersion where you’ll conduct on-the-ground research for an international consulting project. You’ll finish the program with a one-week capstone module and integrative project. The UVic Weekend MBA is built around issues that directly affect British Columbia’s economy – such as sustainability, innovation and globalization – that hold important takeaways no matter where you choose to work. Using BC as a live case study, you’ll learn skills here that you can use anywhere. To give you the best possible learning experience, we are keeping the class size small. You will study and work on projects with motivated professionals who bring diverse experience and perspectives to every problem. You’ll learn to look at challenges from all sides, to think creatively, critically and collaboratively, and to make insightful and informed decisions. From the beginning, you’ll be working on projects designed to apply your learning to practical problems. A major integrative project caps off the program and pulls all your learning together to solve a challenging business issue for a client organization.